Al Bik has faithfully served God, the people of Myanmar and GRN over the last 16 years. 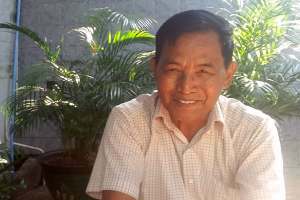 Back in 1999 when Al was looking into serving with GRN he said, "GRN ministry in Myanmar is essential for this vast land and its many languages, as many of the tribal people cannot read or write. I have great interest in ministry among those who cannot hear the Good News just because they cannot read. This is the reason I want to work with GRN." He can now look back and see that many people have had the opportunity to hear the Good News about Jesus Christ as a result of his hard work. He has recorded 100 programs in 64 different languages. Al has had the chance to make recordings in languages for which there were no Christian speakers of that language. He has seen the effect that hearing the Good News in your heart language can have. He has seen God show His power in miraculously rescuing a church building from the bulldozer, and he has seen the sacrifice people have made to remain faithful to their God, despite heavy persecution. Mounting health issues have made travelling around Myanmar increasingly difficult, so Al has been looking for someone to whom he can pass on the baton, and then retire. It has proved a long and difficult search. However, about three years ago David started working with Al. David developed good skills when recordist Kim Knight trained him in recording on Kim's final training trip. Naing Oo joined them two years ago. He has been working on distribution and learning some recording skills from David. So Al passed the baton to David and Naing Oo who are hoping to follow in Al's footsteps. Both David and Naing Oo are in their late twenties and are Bible College graduates. Although they have a solid foundation in the ministry, they still have a lot to learn. Even so, Al can now look at the future of GRN's work in Myanmar with hope. Give thanks to God for Al and all that He enabled him to do. Pray for Al in retirement - for his health and finding his place outside of GRN. Give thanks for David and Naing Oo and their willing service to GRN. *their health, protection and provision, and their families.